Today we have an exciting guest post from Elizabeth Wiegner, an expert freelancer, blogger and online entrepreneur. Her story will most likely inspire you to learn proofreading skills and start your own freelance proofreading business! Is it possible to make up to $100 per hour proofreading online? YES! Proofreading jobs from home can help you make extra money quickly. How many of you are always finding typos in emails and on websites, on the school play program, or even as you’re flipping through TV channels? If this is you, then you might want to learn proofreading! Did you know you can actually get paid (and paid well!) for this kind of superpower? Yep, being a proofreader is a real-life job! I happen to be one! I’ve had several jobs — corporate and freelance — ever since I started working on my own as a preteen. I’ve worked for nonprofits in the legal and human resources departments. Managed a gym, helped grow a company to multi-million dollar status…the list goes on. Of all my jobs though, there has been one I’ve gone back to again and again whenever I needed extra cash. The one I actually loved doing, rather than feel like it was out of necessity…being a proofreader. There’s something about actually getting paid to read and be nitpicky that’s pretty fun. I’ve always had a love for words and reading! It’s all thanks to my parents! My mom was ambitious and taught me to read when I was three. My dad had over 6,000 books in his personal library. My favorite birthday presents through the years were books I’d picked out earlier. The library was my favorite place to go. In other words: I grew up surrounded by books and loving to read. Disclosure: Please note that some of the links on this page are affiliate links. This means that we may earn a commission, at no cost to you, if you decide to make a purchase after clicking through the link. Please understand that we have experienced all of these companies, and we recommend them because they are helpful and useful, not because of the small commissions that we receive if you decide to buy something through our links. Please do not spend any money on these products unless you feel you need them or that they will help you to learn proofreading. Proofreading jobs from home very in pay. Don’t miss this opportunity to learn proofreading from the best! If you want to learn proofreading from a millionaire proofreader, be sure to check out her FREE WEBINAR where she reveals her secrets to making $50 – $100 per hour with freelance proofreading! Proofreading jobs from home are well paid. My proofreading career – why learn proofreading? I survived just a couple years of college, but while there, I got my very first paid proofreading job! I was the primary tutor in the English department’s writing center. I helped students of all levels proofread their papers. And I made a whopping $6.25 an hour. I had to learn proofreading to make minimum wage…. But it was my first proofreading gig. And I was hooked. I ended up dropping out of college, but my love for all things English grammar and reading stayed with me. I started working as a freelancer on oDesk (now Upwork), a popular freelance job site. At one point, I even worked with a team of over 80 writers from around the world, proofreading and managing their projects! For some crazy reason though, I thought I needed to try corporate life out (because everyone has a cubicle job, so it must be awesome, right?). But even then I couldn’t give up proofreading! I was often the go-to person to help proofread announcements, job postings, etc. I also picked up various proofreading jobs on the side. I proofread websites, resumes, continuing education reports, transcripts, novels…the list goes on. Often people associate proofreading with proofreading books. And that’s definitely a huge market to get into! There are hundreds of thousands of books written each year. And within that amount, there are quite a few different genres. Within fiction publications, there is a need for proofreaders who like sci-fi or romance. Within nonfiction books, there’s a need for those who like history or politics. Or even technical books, there are medical or scientific proofreaders needed. But beyond books, there are so many different niches. There are entry-level college students who need their papers proofed. Graduate students working on their doctoral theses. Newspapers and magazines who publish countless words. Court reporters who transcribe depositions and cases. If you want to learn general proofreading from a successful proofreader, be sure to check out her FREE WEBINAR where she reveals her secrets to making $50 – $100 per hour with freelance proofreading! Proofreading jobs from home offer great flexibility. Then consider the giant online world. Graphic designers need their work proofed before publication. Websites with all their sales copy. Blogs with their hundreds of blog posts. Copywriters who send out several emails each week. Social media ad designers who need copy proofed before promoting content. It’s staggering the amount of content that needs an excellent proofreader. But that means there’s proofreading work available for all types of interests out there! It’s a big market, with plenty of room for skilled proofreaders. Let’s talk money! This is why you need to learn proofreading! Earning extra money is the reason most people learn proofreading and start a side business. As there is a variety of proofreading jobs from home that are available, so is the amount of money you can make freelance proofreading. To be honest, there are a lot of proofreaders out there. But there there is a lot of work available. The challenge is to find your niche, build up your reputation, and grow your skills so you can start charging more, find jobs easier, and even start getting referrals! When I started working on oDesk, I didn’t make very much. I took very small-paying jobs I knew I could complete well so I could build up my portfolio and get good reviews. It was a little slow going at first, BUT as my reviews and reputation grew, I could start getting pickier about what I wanted to proofread and how much I could charge! I started doing more jobs I actually enjoyed and charging money that made a difference in my bank account. Like my first proofreading job at college, projects I worked on clocked in at minimum wage. But it made my portfolio look good, and I was gaining experience and getting better with each job I took. As I honed my skills, I started charging more. Now, depending on the technicality of a project, I can make close to $100 an hour just with proofreading! Proofreading jobs from home pay rate varies from $20 – $100 an hour. Through patience, I’ve built an impressive portfolio with thousands and thousands of proofed pages I’ve read in a variety of niches. And I have extremely satisfied clients who recommend me to others (even without me asking them to)! If you want to learn general proofreading from a successful proofreader, be sure to check out her FREE WEBINAR where she reveals her secrets to making $50 – $100 per hour with freelance proofreading! My skill set and corresponding hourly rate is not something that happened overnight though. It took a lot of practice. I applied my years studying grammar. I read specific books to help me learn. I joined Facebook groups for fellow grammar fans. I grew connections with others who loved grammar as much as me and who I could bounce questions off of. …I went after my clients. I interacted in Facebook groups I joined. And by interacted, I mean I didn’t just get in a group and start plastering my proofreading ads everywhere. I provided value wherever I could by answering grammar questions, being friendly, and encouraging others. And I learned to offer my proofreading services only when it seemed appropriate. On freelance job sites, I would actively apply to other jobs. I took time to answer all the job posting questions and send in personable cover letters. I followed bloggers, and I would reach out whenever a proofreading job became available. In other words, I did everything I could to make myself seem like a real person looking after my potential clients’ interests…rather than someone desperate for a proofreading job (even if I felt pretty desperate sometimes!). What makes a good solid proofreader? There are a few key points that have made me a solid proofreader. I’m attentive to specific details. When it comes to grammar and spelling, I’ve spent enough time immersing myself in all things grammar, that I can quickly pick up on errors on a page. If I wasn’t picky about grammar/spelling, I’d be one lousy proofreader. Be sure to learn proofreading properly! It is not as easy as you might think. I’ve invested in quality reference material to learn proofreading. I have an excellent grammar book that’s easy to look up rules in. I also use online resources like the online Chicago Manual of Style and Merriam-Webster. And I use Google. Let me tell you, Google has saved me countless times when I’m hunting down some crazy medical term I can’t for the life of me pronounce (let alone spell!). I’m also willing to do my own research. It’s impossible to memorize every single grammar rule there is or know how to spell super long technical terms. If you want to be a valued proofreader, you will go the extra mile to do your research to ensure a weird word is spelled correctly or that a semicolon is used properly. Besides all this grammar stuff though, one of the keys to being a phenomenal proofreader is being able to communicate in a friendly, efficient way. I have helped many talented proofreaders grow their careers. And while they may be fantastic at grammar, they get lost on how to be a person online. It’s so easy to forget when we’re behind a computer screen, stressed about getting jobs and only seeing words on a page as you’re hunting down jobs, that the clients you’re reaching out to are people too. They like to smile and feel good about themselves, just like you do! And it’s crucial to be able to not only complete a job on time and do it well — but to make sure you treat them like a person as well. Be enthusiastic! Put some personality into your emails. Write how you talk (with proper grammar, of course! ), instead of being a robot. A proofreader who is not only amazing at grammar/spelling but also personable with their clients will not only get repeat work but rave reviews and referrals as well. And it’s pretty awesome when you start getting work you didn’t even have to actively advertise for! Proofreading has opened the doors to so many other work-from-home possibilities for me. As I’ve made connections through proofreading and expanded my freelance career, I’ve worked with online businesses in a multitude of ways. I’ve been involved in business management consulting, graphic design, affiliate promotions, major course launches, copywriting and editing, even developing a product that sold over two million dollars in less than two years. My most favorite role though has been working in leadership with teams built around the world. I love helping teams grow and work together to not only make a business run and be successful, but to grow personally and love their jobs. As I’ve expanded my skill sets and become successful working from home, I’ve been able to help many others as they dive into making their own freelance dreams a success. Most recently, I’ve launched my own course to help people start working from home. With Ditching the Water Cooler: The No-BS Course to Get Started Working from Home, I’ve taken the questions and guesswork out of getting your work-at-home business started. The course walks you through the steps to help you quit your job and start working from home…with no fluff to sift through. You’re busy enough that you don’t need to worry about wading through pointless information! I’ve been a full-time or part-time freelancer for nearly two decades. And I’ve stumbled through the intimidating and frustrating process of trying to build my freelance career on my own. So I want to take what I’ve learned and make it a whole lot less difficult and unfun for others! Whether that’s being a proofreader…or something completely different as a freelancer. Proofreading helped bring me into this wonderful world of freelancing. As I’ve grown my skills, I’ve loved sharing them with others. And I can’t wait to keep inspiring others to grow their freelance dreams as well. Will you try to learn proofreading after reading Elizabeth’s post? Comment below! I’m at a crossroads in my life and I have been unsure of which road to take. This has given me hope that I can take care of myself financially and stop stressing about becoming homeless. I’ve always been a grammar “ho”, it drives me crazy to see errors in social media. A friend of mine told me once that I was the only person she knew who used punctuation when I texted. Thank you! Hi, I promise you that you WILL be able to care of yourself financially! We were in a similar position a few years ago with debt just mounting up. It seems like you might have found online proofreading as your way out! 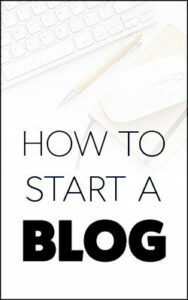 I also suggest freelance writing online for bloggers if you enjoy writing. Many people get started with these work-at-home freelance businesses and change their financial situations pretty quickly. Maleah and I are happy to help you in anyway we can! Good luck!